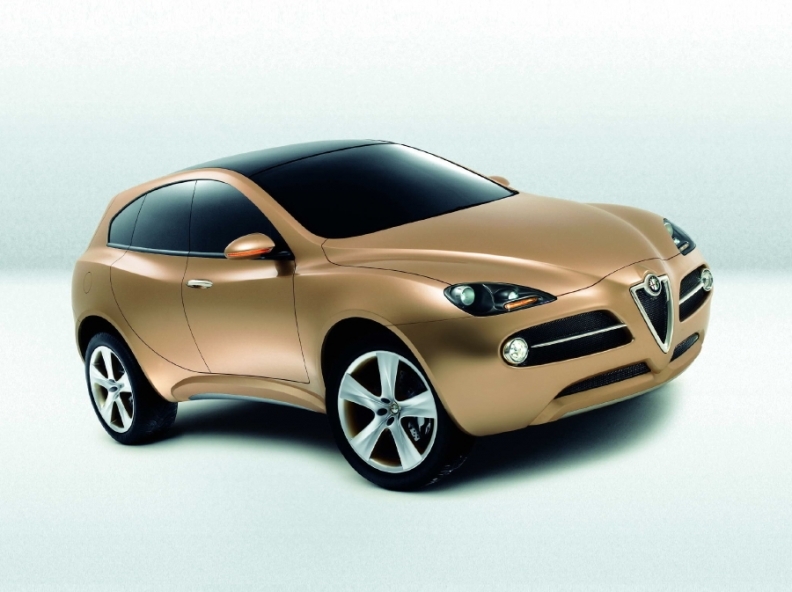 Alfa unveiled the Kamal SUV concept in 2003 but never built it. Its new SUV will be a similar size but more modern and rakish. TURIN – Fiat S.p.A. and Chrysler Group LLC will build 280,000 compact SUVs a year for the Alfa Romeo and Jeep brands starting in 2012 as part of a new joint-venture company that will operate at Fiat's Mirafiori plant in Turin. Fiat on Thursday approved spending about 1.3 billion euros ($1.78 billion) to retool the factory to make the first SUV in Alfa's 101-year history and a Jeep model to replace the Compass/Patriot. Output will start in the third or fourth quarter of 2012, Fiat-Chrysler CEO Sergio Marchionne confirmed during a call with analysts Jan. 27. The Alfa SUV will be aimed at the Audi Q5, BMW X3 and Mercedes-Benz GLK, a Fiat spokesman said. Mirafiori will be the only manufacturing location for the new Jeep, said Marchionne, who added that styling models of both SUVs scored well in recent customer clinics. Half of the 280,000 SUVs to be made in Turin will be sold in Europe and the other half will be exported, mainly to North America. The Alfa models are a crucial part of the brand's North American relaunch, which is set to happen in 2012 or early 2013. Currently, Jeep expects to take about 150,000 units a year while Alfa will get 100,000 to 130,000 SUVs. These volume expectations are “preliminary estimates,” a Fiat spokesman said. The arrival of the SUVs is expected to give new life to the Italian plant, which opened in 1939. The 5,400 workers at Mirafiori have seen production decline to about 120,000 last year from 217,400 cars in 2006. Earlier this month, those workers voted to accept new labor rules as part of Fiat's plan to invest 16 billion euros through 2014, half of which will be used to improve factories and vehicle development in its home market. Fiat S.p.A. will lease the factory's land and buildings to the joint venture. Mirafiori currently builds the Fiat Idea and Lancia Musa small minivans and the Alfa Romeo MiTo subcompact. The minivans will be made at the plant until 2012, which is when production of their replacements is set to start in Serbia. The MiTo, introduced in summer 2008, takes the lion's share of Mirafiori output, with about 60,000 units built last year. The MiTo is included in Fiat's plans until 2014, but it is unclear whether its replacement will be build at Mirafiori after the plant is retooled to make Alfa and Jeep SUVs based on the Compact Wide architecture. The Mirafiori factory will be retooled to build vehicles based on the Compact Wide version of Fiat's Compact architecture, for which Fiat benchmarked Audi and BMW models because it says it wants future Fiat-Chrysler models to deliver best-in-class performance, comfort and safety characteristics. The Compact Wide architecture is about 30mm (1.8 inches) wider than the Compact architecture, which debuted in March 2010 with the arrival of the Alfa Giulietta hatchback. The first vehicle scheduled to use the Compact Wide architecture is a replacement for the Dodge Caliber, which will be made in United States starting in the fourth quarter, with customer deliveries beginning in early 2012.